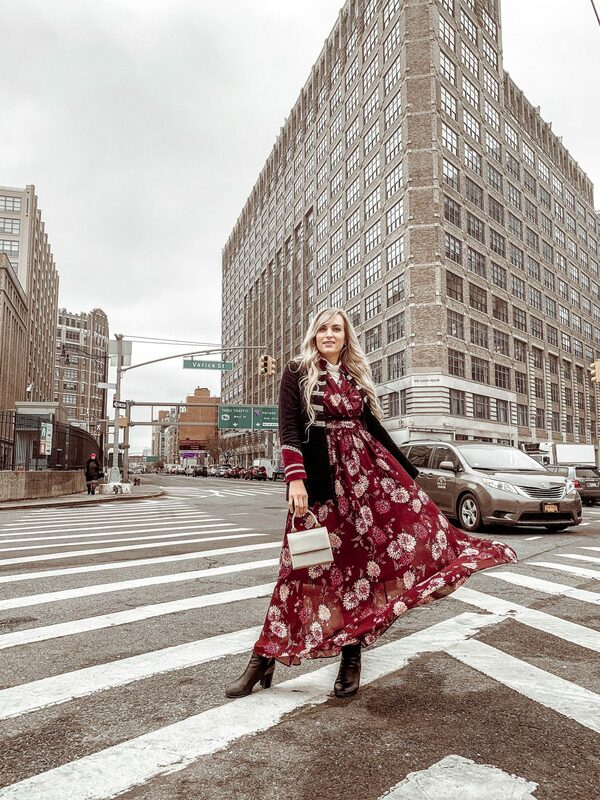 My first February New York Fashion Week was an absolute whirlwind! If you followed along on my instagram stories (saved to my “NYFW” highlight) you’ve seen a bit of the day-to-day and behind the scenes of what I got up to. Starting today, I’ll be sharing a New York Fashion Week recap of each of the 5 days I was there. 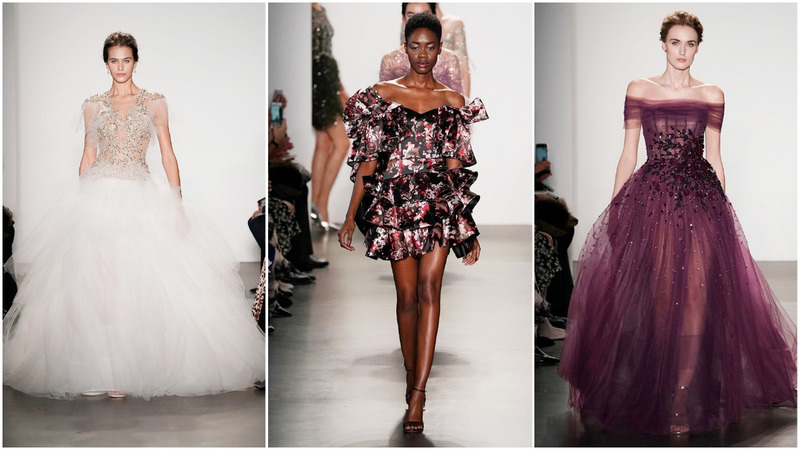 Featuring, of course, a review each of the designer’s shows that I saw that day; making sure you have the scoop about fall/winter 2019 trends! In addition though, I’ll also share the details of what I wore each day, events or meetings I attended, etc. You’ll also see an embedded video clip of each show’s runway (or presentation) so you can see not just what the designer’s newest collection looks like, but the atmosphere of the show itself was like! Subscribe to my my YouTube channel to not miss any videos! 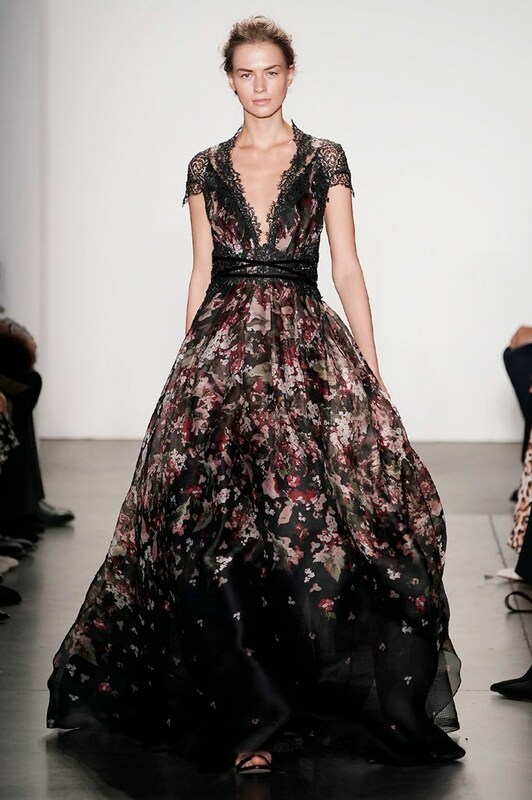 Tadashi Shoji is known for their glamorous evening wear. They truly have such beautiful collections of dresses each year, so I was so honored to receive an invite to this show. The newest collection did not disappoint – with a focus on dresses made of luxe fabrics that move beautifully. It is one thing to have a dress that looks great standing still ( and Tadashi’s definitely do) but the real wow factor to Tadashi’s dresses in this collection is how stunning they look while the model is actually wearing them – walking, moving, and allowing the dress to move beautifully with them. The show notes indicated that this collection was to be “a travelogue to Southeast Asia, a land where wonder blossoms and beauty flourishes. Dazzling temples with rich ornamentation reveal each culture’s artistic expression. Not an inch is left bare. These impressive masterpieces inspire architectural silhouettes”. 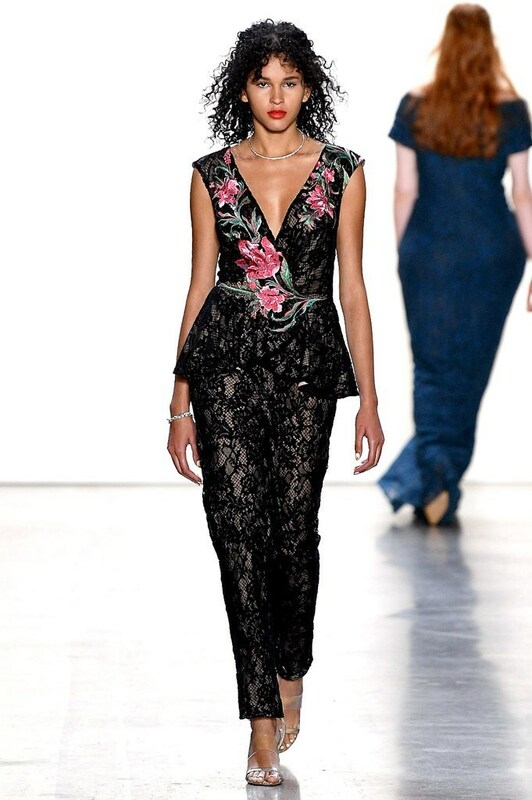 All of this was great, but what really solidified my love and support of Tadashi Shoji has a brand was his size-inclusivity in this runway show. It was so refreshing to see models of different shapes and sizes in the dresses -from typical size zero models, to plus models, to the rarely featured “every day sizes” of women wearing size 6, 8, etc. 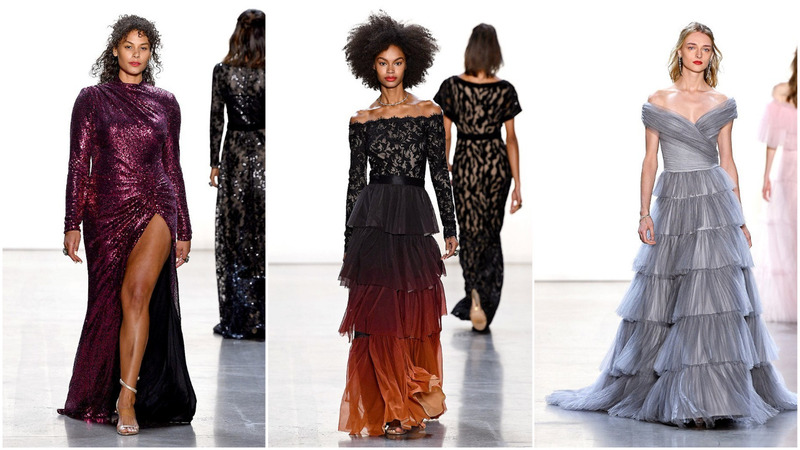 I applaud Tadashi Shoji for taking a leadership role in creating pieces that are made to be worn by any/ all women. 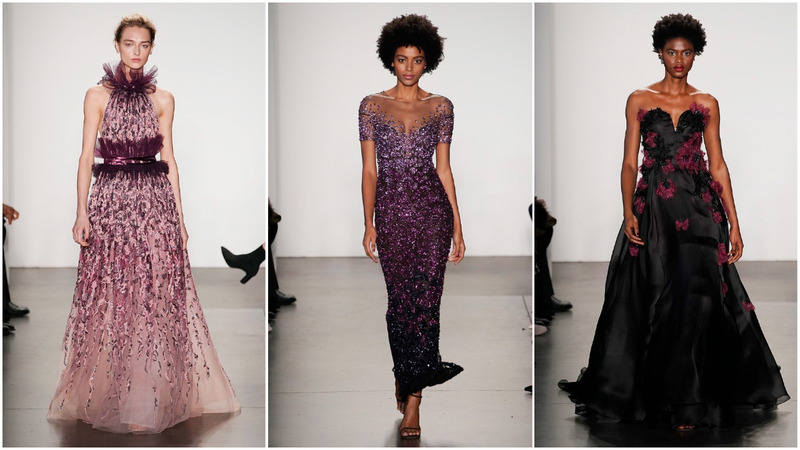 I am a huge fan of Pamella Roland (see my September NYFW recap post for more). I was honored to attend the show again this year, and based on my experience last year I had high expectations for this year’s collection. I am thrilled to report that Pamella Roland did not disappoint! This year’s collection was even more breathtaking than last, with a wider variety of fabrics and an incredible attention to detail. We also see the incorporation of one of the hottest trends right now; feathers. Apparently Pamella Roland specifically added dresses with feathers to her latest collection at the request of her customers. It’s great to see a designer taking direct customer feedback and delivering designs that meet customer needs… likely while exceeding their wildest dreams in terms of the incredible designs. I loved the coloring this collection. While last year was about bold, bright colors (the first yellow pant suit to grace the runway still has my heart) this year’s collection was a bit moodier. There was a focus on black and jewel tones; especially rich wine and aubergine shades. If you love Pamella Roland, but not the designer price tag, don’t worry! I’ve also found some beautiful Pamella Roland pieces in designer consignment shops – I can’t believe some of these dresses are available for under $150! That’s it for my day one New York Fashion Week recap. These two shows were both incredible and the perfect way to start off NYFW. Stay tuned tomorrow for day two! 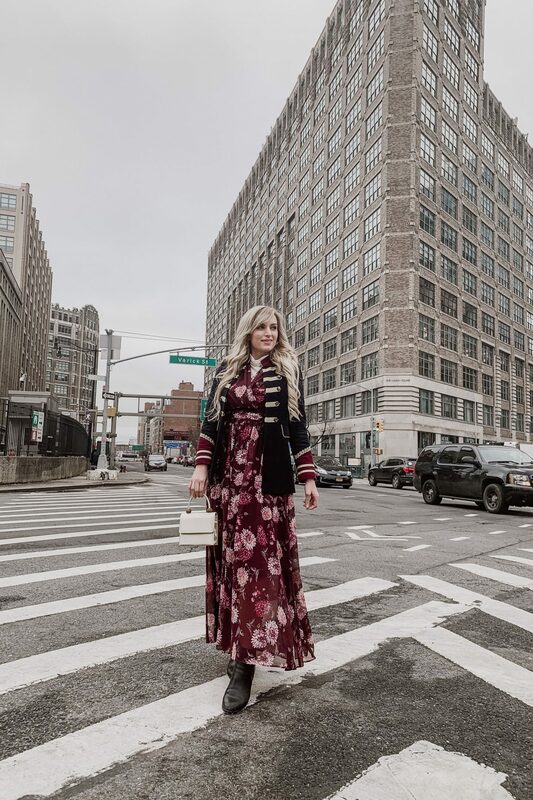 Oh, and as a reminder: you can shop each of my ‘what I wore to NYFW’ outfits in these blogs posts. Below is a widget of pieces from today’s look. For all my looks this week the name of the game was layering. Layered looks are a huge fashion trend right now but, honestly, I needed them simply to survive the cold! For this outfit I layered a thin cream colored turtleneck underneath my longsleeve floral dress and added a blazer on top. As per usual, I wanted a look that plays with the lines of masculinity and femininity. My favorite outfits are always ones that combine traditionally feminine pieces with traditionally more masculine ‘strong’ pieces. I’ve actually been meaning to write a post on this – on what I define my ‘style’ as – so stay tuned for that. Back to this outfit though- in addition to the layering, I wanted to combine the feminine floral print with a masculine military inspired blazer to create this power femininity vibe. I loved the mix of military inspired with floral and highly recommend trying it out! Also, this dress is one of my new favorites and can be styled so many ways. You’ll be seeing it on instagram more over the coming months! 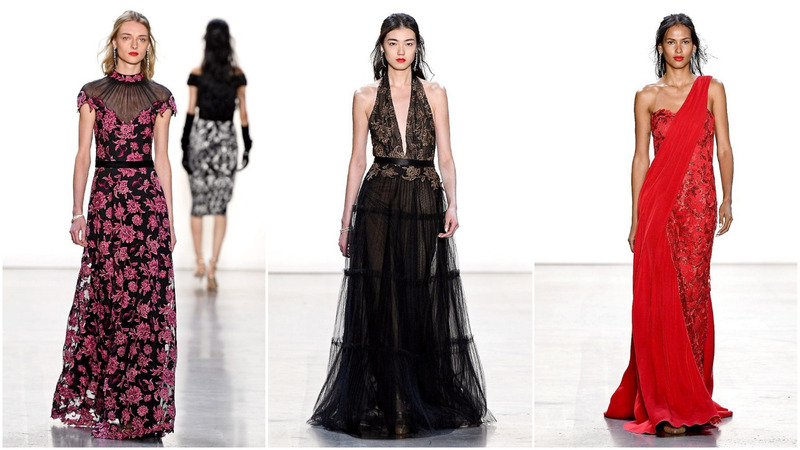 "New York Fashion Week Recap: Day Two"
The Tadashi Shoji dresses are breathtakingly beautiful! I also love what you wore! I’m loving the new trends! Can’t wait for spring and summer. Thank you for sharing! I sure hope I get to do NYFW one day. Especially the one in February – since it’s near my birthday! Love your look too. Aw I hope you do then! It’s such a fun experience. These pieces all look so beautiful – looks like you had an amazing time!! Aren’t they gorgeous! And yes, I totally did! Sounds like such an amazing day!! I’ve always wanted to go to fashion week, this really makes me want to go!! Enjoy! Aw thanks Sarah! You should definitely go in the future! Aw thank you for reading! Im so glad you liked it. And yes the size-inclusivity was so awesome!! Tadashi show’s always wow as do their gowns!!! Hope you had a great time at NYFW – you look absolutely adorable!! Right! I was so impressed! And thank you so much Sarah! How fun! Love how you layered the floral dress. Thank you Jennie! I’m so into the layering trend! Aww thanks Jamie, I’m so glad you liked it! Aww I hope you get to go in the future!! It’s a really interesting experience. I think it’s amazing to attend a fashion week! Great outfit for day 1! Looks like you got to see some fabulous fashion too! Thank you so much! And I did, I loved it!